One year in the making, the Pickleball Rocks team is proud to launch the new website HelpingPickleballGrow.com. We love the time we spend on the courts and hanging out with our pickleball friends. But the one thing we enjoy more than any other is helping communities grow this great sport all across the country. It is so much fun to be a part of the great growth that pickleball is experiencing everywhere. As much as we’d love to, we simply can’t be everywhere, so we spend a great deal of our time building programs that will help players and communities grow even faster than normal. Our latest 3 programs, all available through HelpingPickleballGrow.com, have all been built and tested to help pickleball grow anywhere, anytime. The Pickleball Mile: Offering people the gift of good health through playing pickleball for exercise. Track your pickleball playing and win rewards. Introduce new players and win rewards. The perfect tool to introduce and use in any community and/or club to help your numbers grow. The Pickleball Champions Club: Offering people who champion this sport, the tips, tools and specific techniques that will help grow their club and their community. The Pickleball Rocks Paddle Foundation: Providing free or extremely low cost equipment for schools, YMCAs, and parks and recreation departments. We hope you will join us in the cause to double pickleball in 2015. Talk about the power of pickleball. It can be life changing. JoAnnah is a great example of how pickleball changed her life and can yours too. Enjoy. Guest Columnist: JoAnnah Micheal – USAPA Ambassador and one of the newest members of The Pickleball Mile Club. In the past 6 years I’ve gone through life’s roller coaster of divorce, budget cuts, job loss, bachelor and graduate degrees, and hip surgery. I gained 75 lbs. in the process, because of almost no exercise and constantly eating junk food. July of 2013, I was depressed, and did not know myself anymore. I hated my looks, had no energy, and avoided socials, cameras, and mirrors. Looking at photos of me alone brought such tears of frustration. It was a reality punch! The person who had gained all this weight just wasn’t me! Where was the fight, the grit that makes me, well me!? I knew then that I had to step up and become active. I wasn’t sure how to go about it, but knew that the first step for better health and wellness was overcoming the past six years of life’s negative obstacles in my head to a positive image and then adjust my habits, such as the unhealthy eating habits, sedentary lifestyle, and surgery. So what was that first step? Having been an athlete all my life until these past few years, I focused on positive imagery of a healthier and slimmer me. In order to achieve this I needed to get back into exercising again to reach my ultimate weight-loss goal of 75 lbs. I began to walk every day but that wasn’t enough. While volunteering with the Foundation for Shackleford Wild Horses in Beaufort, NC I decided to check out the Carteret County Parks & Recreation activity programs. Their website included a flyer for some oddly named game called, “Pickleball” offered twice a week at the local Morehead City gym. Much to my surprise I found myself eager to attend a session of this funny named game. Walking in as play had started was tough. However, I was welcomed with open paddles and big smiles. The local USAPA Ambassador taught me this fun and social game, and I was immediately hooked! Pickleball allowed me to play at my own pace while being cautious of my hip/weight/lack of conditioning challenges. Returning to my home in Asheville, NC I started playing locally. It wasn’t easy but other picklers supported me as we encouraged each other to lose weight together. With my background in highly competitive women’s sports I didn’t like being the slowest player on the court! It was hard for me not to overdo it so my hip gave me challenges. The exciting news was that the more I played, the more weight began to drop off and helped ease my hip pain and yes, improved my game too! This motivated me to eat healthier. My pantry and fridge were emptied of all junk food. I boosted my veggie and salad intake and ate smaller meals more often instead of extra-large ones. I now understood why pickleball is the Nation’s fastest growing sport with players with previous injuries that could now get out on a court again and exercise again. I was delighted! Now I usually play five days a week at different WNC venues and enter as many tournaments as I can. My best motivation is to see the numbers on the scale going down and my workout clothes falling off. By setting mini-goals of losing 10 pounds at a time has really worked. Other players saw the positive results and began their own health and wellness goals as we supported each other. While there’s more pounds to lose, I look back at my pickleball weight loss journey and am thrilled. I feel like a new woman at 55 with pickleball being the core of my weight loss success. I love to play and the way this sport makes me feel. 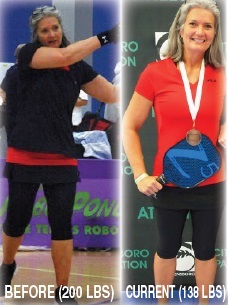 Pickleball has transformed my life and has motivated me to share not only my weight loss journey with others but also, promoting the sport, sharing the rewards of health and wellness, socialization fun and community cohesion. Just some of the reasons why I became the USAPA District Ambassador, NC Mountains District. This positive turn around has brought back my confidence. We all have different ways of reaching ultimate weight-loss goals, but the end results are often the same: a well-deserved sense of accomplishment and a new more positive outlook on life. I’ve earned a tremendous perspective on what it takes to live and maintain a healthier lifestyle. What surprises me the most is how those six years of weight gain melted away in only one year of playing competitive pickleball. Get inspired to get fit and get the best body you’ve always wanted by playing this awesome funny named game! Come join the pickleball weight loss movement and so much more! Everyone deserves to feel this wonderful!